B'laster brand products are born from professional applications where only the strongest survive. We come from a place that demands the toughest solutions, and we believe you should too. As Rust Belt Warriors, we can promise that by the time a B'laster product ends up in your hands, it's only because the pros have told us it's the best. Born and bred in Cleveland, Ohio, the heart of the rust belt. William K. Westley started B'laster Chemical Company after developing PB B'laster in response to a problem a friend was having with mining equipment at a phosphate mine in Florida. Nothing could break through the corrosion - until PB B'laster. PB B'laster penetrates corrosion to allow easy disassembly. Today, PB B'laster is still the #1-selling penetrant in the United States. Westley remained at the helm of B'laster for 20 years before selling it in 1980. Bernie Porter, a Cleveland investment banker, bought B'laster Chemical Company because he saw the potential, and immediately began working to increase market share. 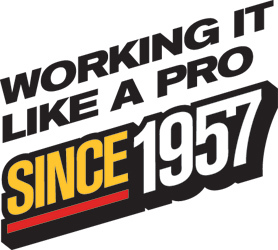 Throughout the next two decades, Porter worked hard to expand the portfolio to include products for use in home, industrial, automotive, marine and heavy-duty truck applications. Bernie's son, Tom Porter, took over as Chairman in 1998 after spending seven years in various roles at B'laster. Tom has been instrumental in the continued success of B'laster set forth by his father, including building brand awareness, increasing product distribution, introducing new products and working closely with management to bring in dedicated and highly-skilled employees. Together, his team has worked hard to make B'laster a nationally recognized brand. The company moved its headquarters and production facilities from Garfield Heights, Ohio, to a brand-new, state-of-the-art building in Valley View, Ohio. A new Leadership Team was created to advance B'laster into the future behind values such as teamwork, leadership, dedication, strong customer service and focusing on our core purpose: We make your life easier by creating products that work where others fail to help solve your problems and save you time, energy, stress and money. The rebranding reflects the evolution of the company and its vision for the future. The new B'laster logo evokes the power, durability and strength of the original brand and product line while maintaining the signature grassroots style in which the company was founded. In the spirit of the never-ending commitment to continuously providing the best formulations, five B'laster products are now enhanced with Teflon™ fluoropolymer to enhance performance, protect surfaces and reduce friction and wear. B'laster is dedicated to upholding the mission of The B'laster Corporation in 2016 and beyond: partnering with suppliers, representatives, retailers and consumers to provide world-class penetrants and other specialty products; investing in global growth by exhibiting proactive flexibility; responding to social, community and environmental concerns; and by creating a family-oriented environment in which all employees feel valued, because they are achieving "The B'laster Way."